Entering words blindly into Google image search isn't always a wise idea. There isn't usually a lot of overlap between grape names and tawdry photos, but I do occasionally get some racy results. Other times, I find out that there's a weird kind of synonymy between the grape I happen to be researching and some random thing in the world. Today, for example, I found out that there is apparently a character named Verdelet in a video game called Drakengard who "is a pious man who is always careful of his words and of doing the right thing, but places himself first should the situation becomes dire." Sure, I could eliminate these kinds of results by always including the word "grape" in my searches, but sometimes those wrong results can shed some interesting light on how a grape may have gotten its name, like with the Trousseau grape. Most of the time, though, those wrong turns just end up at dead ends like the pious, self-interested Verdelet of Drakengard who, I think we can safely assume, has nothing to do with today's grape. Today's grape is Verdelet and it is a hybrid grape that was created by the great French hybridist (hybridizer? hybridder?) Albert Seibel, who we've mentioned in passing in a few posts around here but who we've never really taken a good, detailed look at. Seibel lived from 1844 - 1936 and was a physician by trade. Those of you who are up on your vinous history will note that Seibel was a young man through the heart of the Phylloxera epidemic, which really started to become a noticeable problem in France around the 1860's. Once it became known that native American vines were the source of the louse and, further, that the native American vines seemed to be immune to it, one of the proposed solutions to the scourge was to create hybrid grapes by crossing native European vines and native American vines. This solution was successful, but was not ultimately the answer to the problem since the resulting hybrid vines were unable to produce wines that were qualitatively similar to the native European vines. But just because it wasn't the ultimate solution doesn't mean that it wasn't a viable (and profitable) solution in the short term, and Seibel ended up creating a company that was focused on developing new hybrid grape varieties. Seibel and his group ultimately created over 16,000 different hybrid grapes and had as many as 500 of those available for commercial cultivation at one point. While nowhere near that many are still cultivated today, it is shocking how many are still planted and made into wine. One might wonder why anybody would bother with these vines since the Phylloxera louse has been rendered virtually obsolete by the technique of grafting European vines onto native American rootstocks. The answer is that many of the hybrids created are also tolerant of more extreme climactic conditions, especially cold conditions, such as those found in the northeastern or mid-western United States or in the UK. Further, they tend to be quite disease resistant and also tend to yield generously. For climactic regions that are too harsh for the cultivation of vinifera species, the French hybrids that Seibel and others like him created are a good second choice. Even though the wines made from them aren't as interesting or complex as wines made from vinifera grapes, they are much better than the foxy, ultra-sweet wines made from native American grapes. When I visited the Finger Lakes region of New York recently, I came across a wide variety of hybrid grapes, many of which were created by Seibel. Verdelet, also known as Seibel 9110, is certainly one of them, but Chancellor, Chelois, De Chaunac and Vignoles were also well represented. Grapes like Aurore, Rougeon, and Rosette are also relatively well represented in other parts of the US, Canada and the UK, while the Plantet grape still covers quite a bit of ground in the Loire Valley in France. Verdelet is one of the less common Seibel grapes, and as a result, specific information about it is limited. 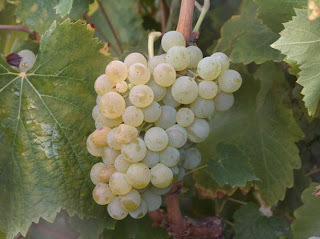 As you can see from the picture above, the grapes are nearly clear when ripe with little green pigmentation their skins. Most nurseries that offer the vine for sale indicate that it is mostly used as a table grape, and a very productive one at that. In a book on wines from British Columbia in Canada, the author gives an anecdote about a producer who obtained 120 tons of fruit from only 6 acres of land planted to Verdelet. Acreage devoted to the grape is declining pretty much everywhere, though it is apparently still fairly popular in Texas. While in the Finger Lakes, I only came across a single wine made from the Verdelet grape. It was made by Bully Hill Vineyards, who we've had some dealings with before around here, and it was a NV wine that I picked up for about $8 in their tasting room. In the glass, this wine was a medium lemon gold color. The nose was moderately intense with aromas of pear, ripe apple, grapefruit and a bit of peachy stone-fruit. On the palate the wine was on the lighter side of medium with high acidity. The label says the wine is dry but I found it to be just off-dry. There were flavors of lime citrus, peach and grapefruit that were tart and zippy. It wasn't a particularly complex wine, but the flavors were bright with a nice intensity. It reminded me a little bit of Riesling, though without the depth and concentration that good Rieslings can have. Overall, I was very pleased with this wine, especially at only $8, and would be eager to try it again the next time I find myself in the area. It was definitely the best thing that I tried from Bully Hill, though that isn't exactly saying a lot. Bully Hill makes a ton of different wines (I mean a ton) and I tried only a few while I was there (for the reasons why, see this post on the St. Croix grape). For the most part, the quality of wines made here isn't that great, but this wine and the Chardonel I wrote about last week were were pleasantly surprising. The Verdelet isn't listed on their webpage, for some reason, so I don't know what kind of availability they usually have, but if you happen across it, it's definitely worth a try. My first exposure to the Pignoletto grape was in the dimly lit tasting cellar at the Wine Bottega in the North End of Boston. The Bottega had invited Alberto Tedeschi, a winemaker from Emilia-Romagna, to come over and present his wines, all of which are made from the Pignoletto grape. It's not often that I am able to meet the person who makes the unusual wines that I buy, so this was a real treat. I found the wines and the man very interesting and picked up a couple of bottles that we'll get to in a bit. First, though, I'd like to take a closer look at Alberto's grape of choice, Pignoletto. The Pignoletto grape is considered the "king of the Colli Bolognese wine zone," but few have heard of it outside of this region. The grape is grown on over 17,000 acres of land in Italy, but it can be very difficult to find wines made from it here in the US, and in fact I've not been able to find another wine made from Pignoletto other than these Tedeschi bottles. For some reason, wines from the Emilia-Romagna region within Italy, other than Lambrusco, can be difficult to find in general. Today's post marks only the second time I've written about a wine from Emilia-Romagna (the first was Mostosa/Pagadebit), and I only have two or three more in my cellar that I hope to write about in future posts. There are a lot of really cool grapes grown in Emilia-Romagna, but for some reason, few of them make it to us over here. Unfortunately, information about the grapes from Emilia-Romagna is about as scarce as the wines themselves. Wikipedia has no entry for the grape and the Oxford Companion to Wine's entry reads in full "lively, crisp white grape grown around Bologna in northern Italy on an area totalling almost 7,000 ha/17,300 acres according to the 2000 vineyard census." What information I've found is scattered on various sites online. Some of those sources indicate that Pignoletto is the same as the Grechetto grape grown primarily in Umbria, but I don't believe that's the case. The VIVC does list Pignoletto as an accepted synonym for Grechetto, but it also has a separate listing for Pignoletto itself, so I believe that the Pignoletto grown in Emilia-Romagna is distinct from Grechetto. The name Pignoletto probably comes from the word pigna, which means "pine cone" in Italian, which is the same root as the red Pignolo grape grown in Friulia, though the two grapes are not related. In both cases, the name comes from the fact that the bunches of grapes produced by the vines resemble pine cones. Some believe that the Pino Lieto referenced by the Roman writer Pliny is the same as the modern Pignoletto, but as we've found before, linking Roman grape names to modern grapes is a virtually impossible task. The grape is unusual in that it has very thick skins which are very high in tannins so most white wines made from the grape are pressed very lightly and moved away from the skins as soon as possible in order to avoid too much tannic extraction into the wine. Alberto Tedeschi leases several small vineyard sites, a one hectare site called Spungola and another small site called Bellaria, that are devoted entirely to the Pignoletto grape. He farms organically and does all of the vineyard work and cellar work himself. He uses natural yeasts for his fermentations and doesn't fine or filter his wines. The first wine of his that I tried was the 2007 "Spungola Bellaria," which is his still wine that is named for his two vineyard sites. I picked this up from the Wine Bottega for about $20. For this wine, Alberto presses the grapes very gently and leaves the juice outside overnight. He then transfers the juice to stainless steel containers and allows the natural fermentation to occur over a 3-4 day span. He then racks the fermented wine into neutral oak containers where the wine ages for at least 12 months on the lees. In the glass, this wine was a deep bronze tinted gold color. The nose was reserved with apple cider, pastry dough and toasted nut aromas. On the palate the wine was on the fuller side of medium with fairly high acidity and a surprising little bit of a tannic grip. There were flavors of toasted nuts and golden apples with a cidery kind of character to it. It wasn't oaky, but did taste kind of woody, like sawdust or like cracked pecan shells or something like that. It was definitely a bit oxidized, though that's almost certainly by design. It was a very unique wine that is definitely not for those looking for squeaky clean, fresh white wines. Fans of the oxidized white wines of the Jura will find a lot to like here. The second wine that I tried was the 2008 Pignoletto Sur Lie, which is a frizzante wine made from Pignoletto grapes, which I picked up from the Wine Bottega for about $25. For this wine, Alberto ages the wine on its lees for at least a year in stainless steel containers. He bottles this wine with a bit of unfermented must which he had kept refrigerated, and the sugar in the unfermented must causes a secondary fermentation in the bottle giving the wine its fizzy character. In the glass, this wine was a deep golden bronze color with light fizz and some cloudy sediment floating around. The nose was fairly aromatic with ripe cidery apples, apple peel, nuts and sweet yeast rolls. On the palate the wine was medium bodied with medium acidity and light fizz. There were flavors of toasted nuts, ripe apples and apple cider with a bit of a yeasty character to it. It too is a bit oxidized, though not to the same degree as the still wine. The wine needs to be carefully served as the cloudy sediment is bitter and the less of it that ends up your glass, the better. It is a very unique wine that is difficult to compare to anything else I've had. Tedeschi only farms about 2.5 hectares of land in total so the quantities for these wines are limited, but they're distinctive and interesting enough that I'd definitely recommend more adventurous wine drinkers seek them out. Even if you've had wines made from the Pignoletto grape before, you've probably not had one quite like either of these two. **UPDATE** I recently was able to try a more traditional wine from the Pignoletto grape and my tasting note can be found in this post. Confusion is usually the first thing that people experience when confronted with the Pecorino grape for the first time. "Isn't Pecorino the name of a cheese?" many ask, and, of course, they're right. Pecorino Romano is the name of a famous sheep's milk cheese made in the Latium and Sardinia regions of Italy, while the Pecorino we're concerned with here is a grape grown on the other side of the Italian peninsula in the Marche and Abruzzo regions. One might be inclined to wonder if the grape and the cheese had something in common given their identical names and the answer is, kind of. Both are derived from the same word, pecora, which means "sheep" in Italian. Pecorino Romano (and Pecorino Toscana and Pecorino Sardo) is so named because it is a sheep's milk cheese. The Pecorino grape is so named not because of any kind of direct link to sheep, but because it is said that sheep particularly enjoyed eating the grapes while they were being driven through vineyards from pasture to pasture. Whether the story of the grape's name is true or not isn't really all that important, but it does give us some idea of how long the Pecorino grape has been around. Sheep herding is something that is still done, but the kind of pastoral imagery that a story like that conjures up definitely makes me think of a much more distant past. And while it is true that the grape itself is thought to be very old, wines made from the Pecorino grape date only to about the 1990's. The story is shockingly similar to the story of the Pugnitello grape from Tuscany, with a slight twist. While Pugnitello was found just growing in a field somewhere, Pecorino had a bibliographic history that dated back to at least 1871 and so it was known to researchers, but it was feared to be extinct. Like so many grapes that have teetered on the precipice of extinction, Pecorino is a somewhat stingy yielder and over time many growers abandoned it in favor of more prolific vines like Trebbiano. Growers make money on volume and Pecorino just wasn't able to sufficiently deliver. In the early 1980's, a man named Guido Cocci Grifoni was doing research on native grape varieties on the eastern coast of Italy within the Marche region. Like the researchers in Tuscany who discovered Pugnitello, part of his research was devoted to trying to save heirloom varieties from extinction, but he was also looking for more characterful grapes to make wine from than the local Trebbiano and Malvasia clones. Rather than starting out by combing the fields, Grifoni and his team started going through the written records for the region and in the course of their research, they discovered the presence of a tiny vineyard on the right bank of the river Tronto which was located 1000 meters above sea level and was owned by an 80 year old man named Mr. Cafani. Mr. Cafani's vineyard was purported to have a few struggling vines of the old Pecorino variety and when they visited the site in 1982, they took some of these cuttings home with them. Grifoni grafted the vines onto modern rootstocks and began trying to grow the Pecorino grape in earnest. The vines didn't give any substantial harvests until the early 1990's, and when they finally started producing usable grapes, Grifoni began experimenting with making wine from those grapes. Encouraged by his early results, he planted more and more land to Pecorino. Eventually he was making enough wine to sell, which he began doing in the early 1990's. Since Pecorino was not an approved grape variety at that time, the first commercial wines featuring the Pecorino grape were sold as vino de tavola, which does not allow any vintage information, grape information or regional information on the front or back labels. Grifoni campaigned for official recognition and received it in 2001 as Pecorino was finally allowed into the Offida DOC zone, where wines carrying the Offida Pecorino DOC designation must contain at least 85% Pecorino grapes. Pecorino has roared back from the brink of extinction and is now grown not only in the Marche and Abruzzo, but also in Umbria and Lazio to the west. It is a fairly thin-skinned grape that performs best at a slight altitude. The grapes can be naturally quite high in sugar, which may help explain their attractiveness for the wandering sheep, and the wines produced from them are frequently in excess of 13% abv. Luckily, the grapes are also blessed with naturally high acidity which helps to keep the alcohol in balance. For those who are curious to learn more (and who can read Italian), somebody wrote a book about Pecorino called La Riscoperta del Pecorino: storia di un vitigno e di un Pecorino, which you can order here. I was fortunate enough to find and try two different wines made from the Pecorino grape, both of them from the Offida DOC in the Marche. The first wine I tried was the 2009 Saladini Pilastri Pecorino which I picked up from my friends at Bin Ends for about $13. In the glass, the wine was a fairly light lemon gold color. I tried this wine at the shop before I bought it and one of the salespeople there said to me "it tastes just like bananas!" which then promptly got into my head and wouldn't leave. I gave myself a few months before I opened it at home, but that memory persisted and all I could smell or taste on this wine was bananas. The nose smelled like bananas. On the palate, the wine was on the fuller side of medium with fairly high acidity and tasted like bananas. There was also some lemon, green apple and pineapple with a hard, steely kind of minerality to it, but the dominant flavor was still bananas. Not even like fully ripe bananas either but like Laffy Taffy banana flavored candy, which I really don't enjoy. I tried leaving my glass on the counter for a few hours but when I came back to it, it still smelled and tasted like bananas. I read up on the grape to see if this was a common characteristic, and it certainly didn't seem to be, so I set about to track down another bottle for comparison's sake. The second bottle that I was able to find was the 2009 Tenuta Cocci Grifoni "Colle Vecchio" Pecorino which I also picked up from my friends at Bin Ends for about $14. This is the winery owned by Guido Cocci Grifoni who was responsible for discovering the Pecorino grape in the first place. This wine is made from some of the original grafted vines and probably contains the oldest vine Pecorino juice available today. If any winery could be said to make the benchmark Pecorino, surely this would be it. The first bottle I bought was disappointingly corked, but Bin Ends replaced the bottle and the second was much better. In the glass the wine was a pale silvery lemon color. The nose was fairly reserved with some white pear and green apple. On the palate the wine was medium bodied with fairly high acidity. There were flavors of bright green apple, lemon peel and a lot of ripe, juicy pear. The wine finished with a kind of chalky minerality. It's not an assertively flavored wine, but it is well balanced and refreshing. Fans of high acid whites should find a lot to like about Pecorino. Researching hybrid grapes can be brutally and mind-numbingly boring sometimes. There are the occasional interesting cases of older grapes like Delaware, but the closer you get to the present day, the less interesting the back-stories for these grapes tend to be. Generally speaking, these hybrids have been created in a laboratory setting in order to meet a specific need, such as cold-hardiness or disease resistance, and their status as engineered products puts off a lot of people who are seduced by the romance of nature in grapes and wine. Most of the information that is published about these grapes reflects this utilitarian functionality and is aimed more for growers and for researchers than for consumers. It tends to be loaded with descriptions about the vine's temperature preferences, disease resistance and susceptibilities, yields, and more physical description of each part of the plant than you would ever want to know. There are few places to try and get a good narrative foothold since there's rarely any kind of mysterious back story or human angle in the grape's creation. Sure, the grapes are ultimately made by people (scientists are people after all), but the creation stories for these grapes almost never focus on them, opting for information about their pedigree and behavior in the field instead, which ultimately ends up coming across as sterile and dull. They're basically plant catalogs whose function is to convey a certain kind of information as simply and efficiently as possible. This certainly isn't the case for all hybrids and crossings. Some of the older hybrids and crossings are interesting because there is a distinct human element present in their story. Grapes like St. Croix, for instance, which was created by an amateur in Wisconsin in his own back yard. Or grapes that were created by people like Harold Olmo or Albert Seibel who were prolific in their efforts and were extraordinarily successful in creating a large number of grapes that are still somewhat widely cultivated today. I like to think of these guys as mad scientists in flickering rooms cluttered with arcane equipment who are hell bent on unleashing their huge armies of Frankengrapes upon the world. People like that are out of date now, though, as most grapes are created by teams of scientists at breeding institutions who are fortunate if any of their creations are ever made available for public use. In the case of the Chardonel grape, the published paper announcing the grape's release has eleven authors on it, which should give you some sense of the collaborative effort required for its creation. One man who creates a dozen grapes is interesting but a dozen people who create one grape is a different story altogether. But Chardonel was created and it is available for commercial propagation. Since I was able to track down a bottle of it, I'm going to tell you the most interesting things that I've been able to find out about it. Chardonel was created at Cornell's New York State Agricultural Experiment Station in Geneva, NY, in 1953 from a crossing of Seyval Blanc and Chardonnay. Seyval Blanc is itself a hybrid which is grown mainly in cooler climate regions like the Finger Lakes in New York and, surprisingly, in England. The full pedigree for Chardonel can be seen here and it's an interesting view of just how grueling it can be to create a viable hybrid. If you just stopped the family tree at Chardonel's parents, it would look like a fairly simple project, but as you go deeper and look at the family tree for Seyval Blanc, it gets dizzying in a hurry. All of those fields that are simply letters and numbers are other hybrid grapes created by other hybridizers which were never deemed good enough for commercial release and thus never named. The letters represent the hybridizers last names (S = Seibel, for example) and the numbers correspond to whatever numbering convention each hybridizer used to catalog his own creations. Though the Seyval x Chardonnay crossing responsible for Chardonel happened in 1953, the fruit was not observed until 1958 and the vine wasn't chosen for experimental propagation until 1960. The grape wasn't released to the public until 1990, though, for reasons we'll get to momentarily. I mentioned above that the paper announcing Chardonel's release had 11 authors and implied that they were all involved in the grape's creation, but the fact of the matter is that the very long time between the grape's creation and its release makes it difficult to say for sure who was involved and in what capacity. The VIVC and this page at Iowa State University lists the grape's creators as Reisch, Pool and Einset. Reisch and Pool are the lead authors of the announcement paper, but Einset is only mentioned in the acknowledgements. I'm not sure who the other 9 people given an author credit in the paper are or what their role actually was. 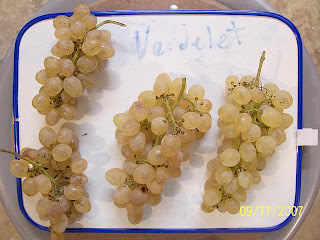 Like most grapes created at the New York State Agricultural Experiment Station, Chardonel was bred specifically to be able to handle cold conditions. Seyval Blanc is noted for its winter hardiness and the hybridizers were hoping that they could create something as hardy as Seyval with the flavor characteristics of Chardonnay. And to some extent, they were successful. Chardonel has much better winter hardiness than Chardonnay and is rated as hardier than Seyval in Michigan but as slightly less hardy in most other places. It does ripen late, though, which is a problem for cooler areas with short growing seasons like New York. Wines made from the Chardonel grape are generally regarded as preferable to those made from Seyval, and wines made from grapes grown in warmer areas like Missouri and Arkansas are considered superior to those of New York. The reason that the grape wasn't released for 30 years is that the fields tests being done in New York weren't promising enough to warrant release. Some vines were planted experimentally in Michigan and Arkansas, though, and the results from those vines were so encouraging that the grape was finally named (it had been known as New York 45010 at first and then as GW9 prior to 1990) and released. I was able to find a bottle of Chardonel at Bully Hill Vineyards on my trip to the Finger Lakes region of New York a few months back. I've previously written about my experience at the winery and interested readers can find that information here. Bully Hill is weird about their vintages and this wine isn't labeled with one. It cost me about $8 in their tasting room. In the glass the wine was a medium lemon gold color. The nose was very reserved with a whiff of pear if I used my imagination, but overall it was a total blank. On the palate the wine was medium bodied with fairly high acidity. It is one of the few dry offerings that Bully Hill has. There were zippy lemon and lime citrus flavors with some green apple and citrus peel with a touch of green melon on the finish. 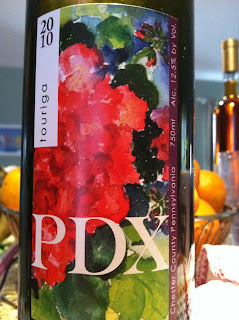 The wine was bright, lively and interesting, which was much more than I was really expecting. The label on this wine honestly put me off of it for a long time and I kept looking at it in my cellar and dreading the thought of opening and drinking it, but I found it very nice. I would gladly pay $8 for this again and am now very curious about these superior wines being made from Chardonel elsewhere in the US. A few weeks ago, I wrote about the Hondarrabi Zuri grape. The way things typically work around here is that I do a few hours of research, write my post and move on. This post was different, though. The first source I consulted, the online version of the Oxford Companion to Wine, had as the very last sentence "DNA profiling has surprisingly shown that Hondarrabi Zuri is the same as the American hybrid Noah." If true, this would be a shocking fact as it would represent, as far as I know, the only case in all of the EU where a hybrid grape, particularly an American hybrid grape, was not only the most widely planted grape in a given region, but was also one of the recommended grapes for cultivation there. I set about feverishly to try to track down the source of that bit of information. The OCW rarely directly cites sources for their entries online, but when doing research for other posts on the blog, I've been pretty successful in finding the original source material for the OCW's claims. This case was different, though. After hours and hours of searching, I had found nothing. The best I was able to do was to find a pair of papers written in 2003 (citations below) that analyzed a bunch of different Spanish grapes using DNA microsatellite analysis. Both papers found that the sample of Hondarrabi Zuri used had a genetic profile that was wildly different from the other samples. The paper by Martin, Borrego, Cabello & Ortiz offers the "probable hybrid origin" of Hondarrabi Zuri as explanation for this wild variation, but they give no further information. I wrote my post with this information at hand, but ultimately wasn't satisfied with where I had ended up. The next day I emailed Dr. Jesus Maria Ortiz, one of the authors of one of the papers I had read, in the hopes that he could help me clear the issue up. Dr. Ortiz clarified that there was a grape variety grown in the Basque region of Spain for many years that was called Hondarrabi Zuri which was almost certainly a hybrid grape. It had the noted "foxy" aroma and flavor that many of these grapes can have as well as having ampelographic features that were more consistent with a hybrid grape than with a v. vinifera grape. This grape wasn't the same as the grape being used for wine production in the Basque region, though, and, in fact, according to Dr. Ortiz, this hybrid grape has virtually disappeared from the Basque region altogether. The grape being used to make Txacoli wines was a full vinifera grape, unrelated to the hybrid grape, and he kindly provided me with the DNA microsatellite profile for the vinifera Hondarrabi Zuri which, it turns out, is completely unrelated to the Hondarrabi Beltza grape also cultivated in the region. A brief aside: why are they both called Hondarrabi if they aren't related? There's a town called Fuenterrabia (the Basque name for the town is Hondarribia which means "sand ford" in the Basque language) on the Bidasoa River which is very near the border between Spain and France. Dr. Ortiz believes that several grape varieties came into Spain from France and were planted around this town (as we'll see below, nearly all of the Hondarrabi Zuri grapes are ultimately from France, though Hondarrabi Beltza's origin is unclear). When they were planted elsewhere in the Basque country, they were given the Hondarrabi prefix to indicate where they had come from. Zuri simply means "white" in the Basque tongue while Beltza means "black." When most of these DNA studies are done for wine grapes, the scientists typically don't go out into the fields themselves to gather plant matter. There are collections at various universities called "germplasm collections" which are filled with plants that were collected at some point from the field, but which are maintained by the university for the purpose of having a source of genetic material for a given plant on hand at all times. In this case, for both of the studies cited above, the research teams used samples from the Spanish National Grape Collection at El Encin in Madrid. For whatever reason, the vine stored at El Encin and marked as Hondarrabi Zuri was the hybrid grape and not the vinifera one. When these vines are initially collected from the field, the researchers have to rely on ampelography and local lore to tell them what the name of the grape they are picking actually is. Think about it: if they're collecting the vines for the purposes of genetic research, then the genetic research hasn't yet been done on the vines they're collecting. Mistakes can be made in the field and a grape can be mislabeled in the germplasm collection, leading to trouble down the line. In this case, here's what I think may have happened. The germplasm collection contained a vine called Hondarrabi Zuri and one called Hondarrabi Zuria (both Zuri and Zuria mean "white"). When the research teams ran the analyses on these two samples, they turned out to be identical, which isn't all that unusual and, in fact, is one of the primary reasons scientists run these tests. I think what may have happened was that these two grapes are different in the field, one being the vinifera grape used for Txacoli and the other being the hybrid grape, but two samples of the hybrid were taken and labeled by mistake. This is pure speculation, but it seems plausible to me. I asked Dr. Ortiz about the relationship between Hondarrabi Zuri and Beltza because I hadn't seen anyone specify what their relationship was, which seemed odd given how similar their names were. The only mention I'd seen was in the Oxford Companion to Wine, which didn't have an entry for each grape, but rather had a single entry under the heading "Hondarrabi" where they indicated that it was a family of grapes (which would imply that Hondarrabi Beltza was also a hybrid, if their claim about Noah were true). Given the information that I had obtained from Dr. Ortiz, I contacted the OCW and heard back from them a few hours later. Julia Harding, MW, sent me a very nice email saying that they agreed with my complaint about the use of the word "family," and they have since struck it from the online entry (though there is still only a single entry for Hondarrabi). She also told me that she and Jancis Robinson had been working with Dr. José Vouillamoz on their new book about grapes (which is due out soon and whose publication I am anxiously awaiting), and the bit about Hondarrabi Zuri being the same as the American hybrid Noah came from Dr. Vouillamoz's personal research, which had not been published. She forwarded my query on to Dr. Vouillamoz who I then struck up a correspondence with. Dr. Vouillamoz confirmed that the identification of Hondarrabi Zuri with Noah was done by comparing the sample of Hondarrabi Zuri available at the Spanish National Grape Collection at El Encin in Madrid (which was used by both papers cited previously) with a sample of the Noah grape in the collection of the Agroscope in Switzerland. Based on this, he and the editors of the OCW had concluded that Hondarrabi Zuri = Noah. I forwarded my correspondence with Dr. Ortiz to Dr. Vouillamoz to see what his take on our conversation was. At the same time, I emailed Dr. Ortiz again to ask why the sample for Hondarrabi Zuri at the Encin was the hybrid and not the more widely planted vinifera grape. Dr. Ortiz has responded that he does not know, but that the fact of the matter is that the sample at El Encin marked as Hondarrabi Zuri is not (or was not, I don't know if the germplasm collection has been updated recently) the same as the grape grown in the field and approved for use by the DO. Dr. Ortiz also forwarded my question along to Dr. Felix Cabello. In the text of his email to Dr. Cabello, Dr. Ortiz remarks that at some point after their 2003 study, the team picked up a grape referred to as Hondarrabi Zuri Zalla (so named because it was found around the Basque village of Zalla, I'm assuming), which is the grape that was approved by the DO and which is used for the production of Txacoli wines. This Hondarrabi Zuri Zalla is the official Hondarrabi Zuri, and is the same as a French grape called Courbu Blanc. Somewhat confusingly, there is also a grape called Hondarrabi Zuri Zerratia, which is the French grape Petit Courbu. 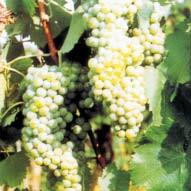 These two grapes (Courbu Blanc and Petit Courbu) are related to one another but are ultimately different cultivars. The last email I have from Dr. Ortiz states unequivocally that the grape that is known officially as Hondarrabi Zuri is actually Courbu Blanc. At virtually the same time, I received an email from Dr. Vouillamoz who had just read through my correspondence with Dr. Ortiz. He had reached the same conclusion and believed that Hondarrabi Zuri was the same as Courbu Blanc (though he insists on maintaining that, sometimes, Hondarrabi Zuri also refers to Noah, which is true in a scientific sense if not a practical one). Both the French and the Spanish Wikipedia entries for Txacoli seem to agree, as they equate Hondarrabi Zuri with Courbu (which can refer either to Courbu Blanc or Petit Courbu, but in this case clearly refers to Courbu Blanc). "DNA profiling has surprisingly shown that some vines of Hondarrabi Zuri are the same as the American hybrid Noah although the situation is particularly confusing because the name Hondarrabi Zuri is also used locally to refer to two other unrelated varieties: Crouchen and Courbu Blanc." I've emailed them with the information that I have found, and they are sticking with their entry as it is written above, despite the fact that two different scientists have confirmed that the grape commonly referred to as Hondarrabi Zuri is, in fact, Courbu Blanc. I'm reading this entry as saying that Hondarrabi Zuri is a distinct variety that is different from Courbu Blanc and Crouchen, but which is not related to either, which doesn't seem to be right to me. It is true that Hondarrabi Zuri is occasionally used to refer to the Crouchen grape in this region, which is not related to Courbu Blanc, and I suppose you could read the post that way if you were in a generous mood, but I believe that the entry as written is still wrong. The OCW was cooperative in this case, but was utterly uncooperative in the case of Emerald Riesling. As I mention in that post, when I questioned them about the information they had published, they merely told me that I had the incorrect information and that I would have to wait for the publication of their book (which retails at a whopping $125) to find out what the truth actually is. I would be fine with this if I wasn't already paying (dearly and annually, I might add) for the electronic version of the OCW, which they are coyly updating on the fly as they find new information, whether it is correct or not. If I were paying for an online version of the book I also have on my shelf at home, that's one thing, as static reference materials go out of date all the time. But since they are updating the work online, it doesn't seem unreasonable to ask for clarification on a matter where the information that they are printing is in opposition to every other resource currently available, including a written statement from the man who created the grape himself. The OCW is a valuable resource, but they're not infallible, as I hope I've shown in this post. If you are going to charge people for access to information, I feel that you should be prepared to justify that information if asked and should not point them to another place where they can give you more money for the whole story. If you're willing to publish part of the story in the OCW and take people's money for it, you should be willing to publish the whole story instead of using premium content as a teaser for more premium content. I don't subscribe to the OCW to read part of a story, and I'm starting to question whether I should be subscribing to it at all. I've written much more about the Emerald Riesling issue in this post. Ibanez, J., de Andrea, M.T., Molino, A., & Borrego, J. "Genetic Study of Key Spanish Grapevine Varieties Using Microsatellite Analysis." American Journal of Enology and Viticulture (54:1). 2003. 22-30. Martin, J.P., Borrego, J., Cabello, F., & Ortiz, J.M. "Characterization of Spanish Grapevine Cultivar Diversity Using Sequence-Tagged Microsatellite Site Markers." Genome (46). 2003. 10-18. We've covered some extreme climates on this blog, from the wind-swept desert conditions of Santorini to the frigid coast of New England, but we've never dealt with anything quite like the village of Morgex in the Valle d'Aosta. Sure, we've dealt with other villages within the Valle d'Aosta and have taken a look at quite a few grapes grown here (such as Cornalin, Prëmetta, Petit Rouge and Petite Arvine), but Prié Blanc and Morgex are in a class by themselves. If you've read any of the other posts I've written about wines from the Valle d'Aosta, you may remember that one of my favorite bits of trivia about this region is that despite the altitude of the vineyards and the overall cool climate, almost 90% of the wine production here is devoted to red wines. When most people think about the Alpine wines of France or Switzerland, they tend to think of white wines like the Jacquère of Savoie or the Chasselas of Switzerland. The Valle d'Aosta doesn't really follow that mold and white wines from this region can be difficult to find. White wines made from grapes that are indigenous to the region are even tougher since there's only one: Prié Blanc. White wines are made from a handful of other grapes like Pinot Gris, Chardonnay and Petit Arvine, but all of those grapes are imports from the surrounding countries. Prié Blanc is the only known white grape from the Valle d'Aosta and its history in the region can be traced back at least into the early 19th Century. In a book about the grapes and wines of the Valle d'Aosta published in 1838, an Italian by the name of Gatta mentions Prié and indicates that the grape is synonymous with Premetta, but the two grapes we know by those names today are clearly very different. For starters, Prëmetta is a red grape while Prié Blanc is white. Most sources actually refer to Prié Blanc simply as Prié, so I wonder if at some point it was thought that Prié Blanc and Prëmetta were mutations like Pinot Noir and Pinot Blanc and the Blanc was added on to distinguish it. There is a Prié Rouge which has Premetta as a synonym, but I don't know anything else about it. A study published in 2002 indicates that Prëmetta and Prié Blanc share a lot of the same genetic material, but are definitely distinct cultivars. For some reason, the VIVC lists Prié Blanc under the prime name of Agostenga, which is generally used as a synonym for Vermentino, but which in this case is a distinct variety. I haven't seen Agostenga pop up anywhere else in reference to Prié Blanc so I'm not quite sure what to make of that. To add to the naming confusion, many people refer to the grape as Blanc de Morgex, which is actually the geographical designation for where the wines are made. To be even more precise, the region is called Blanc de Morgex et de La Salle, as it encompasses both the Morgex and the La Salle villages. There are 54 acres of land between these two villages which are registered for DOC production and most of them are planted to the Prié grape (the Blanc de Morgex DOC only allows the Prié grape but if a grower within the Blanc de Morgex zone planted Pinot Gris, for instance, they could use the Valle d'Aosta Pinot Gris DOC designation but not the Blanc de Morgex one). These vineyards are the highest in Europe, standing at over 4000 feet (1200 meters) above sea level. As a result of the elevation of the region and its seclusion from other wine making regions, phylloxera never arrived in Morgex and La Salle so all the vines are still planted on their original rootstock. The elevation also limits what grapes could even be planted here as the cool temperatures mean that grapes that need a long ripening season aren't going to get enough warmth and sunlight to make it. Luckily, Prié Blanc is an early ripener that thrives in this shortened growing season (the grapes that don't quite make it are used for sparkling wine production). Wind is also a problem this high up so the vines are trained low to the ground to minimize their exposure. 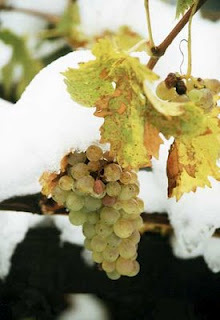 Many of the the vineyards are also located very near the snow line for the mountains and picking is often done in snowy conditions for both table wine and ice wine production. Wines made from the Prié Blanc grape can be a challenge to find outside of the Valle d'Aosta but I was recently fortunate enough to pick up a bottle (2008 vintage) from my friends at the Wine Bottega for about $20. The producer is 4000 Metres which is a consortium that sources its grapes from the Cave du Vin Blanc de Morgex et de La Salle, which is itself a cooperative of about 90 growers who all farm their own small patches of Prié Blanc. The grapes are all hand picked and only native yeasts are used for fermentation. The wine is lightly filtered, aged for a brief time on the lees and then aged six months in bottle prior to release. In the glass the wine was a medium lemon gold color. The nose was very aromatic with lemons, ripe pears and apple juice fruits with a slightly leesy and slightly chalky kind of edge to it. On the palate the wine was on the lighter side of medium with very high acidity. There were flavors of lemons, green apple, apple juice, and lime with a chalky, stony minerality on the finish. The fruits were vibrant, electric and intense but stayed nicely grounded by the strong minerality at the end. This is one of the better white wines I've had in awhile and really has everything that I'm looking for in a white wine. Excellent acid, intense fruit and a clean, refreshing finish. For those of you who are allergic to wines at the $20 price point and above, I'd advise you to put that prejudice aside for this wine and give it a shot. It's unique, well structured and very delicious. Pop quiz time: what is the most widely planted white grape in Portugal? If you're having trouble coming up with a Portuguese white grape at all, you probably have some pretty good company. If you had asked me this same question when I started writing this blog, I would have guessed Alvarinho, but really only because that would have been the only grape that I knew. I discovered that Fernão Pires was the most widely planted white grape in Portugal after I bought my first bottle, and I was definitely surprised. I know that the Portuguese are crazy about blends and finding a varietal wine from Portugal is tough as it is, but finding a varietal Fernão Pires was pretty difficult for me and by the time I had tracked one down, I had actually seen a lot of varietal bottlings from a host of other grapes. The important thing, though, is that I was able to find one (along with an interesting dessert wine as well), so without further ado, let's talk a little bit about Fernão Pires. Fernão Pires is grown throughout Portugal though most of the plantings are concentrated in the central and southern regions. The Ribatejo region, located just east of Lisbon in the center of the country, is where most of the plantings of Fernão Pires can be found (in fact, Fernão Pires makes up 40% of the total plantings of this region). Ribatejo is a voluminous area in terms of total production, standing second only to the nieghboring Estramadura region, and it's because most of the vineyards are planted on very fertile alluvial soils in the river plains of the Tagus River (which is sometimes called the Tejo river, hence the Ribatejo name). Fertile soils equal high yields which generally means low quality, and that equation holds true here as only about 5% of the production of the Ribatejo finds its way into DOC wines. As in nearly all valleys, there are high quality sites away from the valley floors where better wines are made, but most of these sites are planted to the red varieties Castelão and Trincadeira, with only a few producers planting white grapes on these sites. The grape is also grown in the Barraida region, which we are familiar with from our look at the Baga grape, though it is typically called Maria Gomes there. In 1999 a team of scientists analyzed four different grapes, three of which were called Fernão Pires but which were grown in wildly different geographical regions of Portugal (Vinho Verde, Ribatejo and Oeste which is just West of Ribatejo on the Atlantic coast), and one called Maria Gomes and found that the four grapes were genetically identical, which means that Fernão Pires and Maria Gomes are synonyms for the same grape (Lopes, M.S., Sefc, K.M., Eiras Dias, E., Steinkellner, H., Laimer da Camara Machado, M., da Camara Machado, A. (1999) "The use of microsatellites for germplasm management in a Portuguese grapevine collection." Theoretical Applied Genetics, (99) 733-739.). This blog seems to think that the Fernão Pires name comes from a 16th Century Portuguese merchant, pharmacist and explorer named Fernão Pires de Andrade who was apparently instrumental in opening up trade channels with China, establishing a Portuguese embassy in Beijing, and then so insulting the Chinese that the two nations refused to do business with one another for about 40 years. His Wikipedia biography doesn't mention grapes or wine at all, so I'm not sure if he's really the source of the name of the grape or not. I'm also not sure about the source of the grape's other name, Maria Gomes. There are two different women named Maria Gomes who have awesome life stories, but I'd be surprised if the grape was named for either of them. The first is Maria Gomes Valentim who was the oldest verified living person in the world for about a month in May of 2011 until she passed away. She was 114 years 347 days old at the time of her death, making her one of the 30 oldest people in history. The other person was Maria Teresinha Gomes who pretended to be a general in the Portuguese army for over 20 years while she swindled her neighbors out of their savings in a series of investment scams. Why is that a big deal? She did it while posing as a man, even living with a woman at one point who was unaware of her gender until after it was revealed during her trial. She was arrested and put in prison for three years. She died a free woman in 2007, though she was too poor to pay for her own funeral at the time. It seems odd that the two most common synonyms for this grape are both names, one male and one female, but I can't see to find anything that would indicate that it's more than a coincidence. It seems likely that Fernão Pires was named for Fernão Pires de Andrade, but the best evidence that I can find for it is that Fernão Pires de Andrade is the only other result you get from Google when looking for information about the Fernão Pires grape. It's solid correlative evidence, but it's not enough for me to positively conclude that the grape is named for the man. Maria Gomes is a much more common name and I can't find anything to link the grape to any individual with that particular name. If anyone has any ideas, I'm open to hearing them. I was able to find two different wines, one table wine and one fortified dessert wine, made from the Fernão Pires grape. The table wine was the 2008 Quinta do Alqueve from Ribatejo which I picked up for about $8 from my friends at Curtis Liquors. In the glass, the wine was a pale silvery lemon color. The nose was reserved with some white pear, lemon rind and a touch of herbaceousness. On the palate the wine was on the lighter side of medium with medium acidity. There were flavors of lemon citrus, white pear and fennel bulb with a slightly chalky, slightly stony kind of minerality on the finish. This is probably the kind of wine that is best within a year or two of the vintage, even though Wikipedia informs us that it can be held for 2-3 years before drinking. I didn't hate this wine, but it really didn't do much for me and I found little in it to distinguish it from pretty much any other white wine at this price point. It wasn't bad, it just wasn't very interesting. I'm actually sitting here having a really hard time even remembering this wine not because I shotgunned it straight out of the bottle but because it just didn't have a lot of character to it. If you refuse to pay more than $10 for a bottle of wine, you'll probably find a lot to like here, but if price isn't really a concern for you, then I'd be hard pressed to find a reason to recommend this to you. The second wine that I found was the NV Quinta da Alorna "Abafado" 5 Years bottling which I picked up from my friends at the Spirited Gourmet in Belmont for about $12. This wine is also from Ribatejo, but in 2009 the Ribatejo region became known simply as Tejo. According to the winery's website, this wine is made from 100% Fernão Pires grapes. The grape must is partially fermented and then spiked with brandy while there is still quite a bit of sugar left in order to arrest the fermentation (the final ABV for the wine is 17.5%). The wine is then aged in old oak barrels for five years before being bottled. In the glass, the wine is a pale tawny bronze color. The nose is somewhat aromatic with dominant notes of raisins and brandy with a touch of something nutty. On the palate the wine is on the fuller side of medium with medium acidity and medium sweetness. There are flavors of raisins, burnt sugar, toasted nuts and something just a bit smoky. It tastes a bit like someone took a box of Thompson Seedless raisins, soaked it in brandy overnight and then lit it on fire. It's not as rich and complex as an aged Tawny Port or a good Madeira, but it is very good and is much better and more interesting than those things that are just labeled "Tawny Port" or "Madeira." The $12 price tag is for a full-sized 750 mL bottle, so this does represent a good, interesting value for those who like these oxidative fortified dessert wines (and I definitely do). I love drinking these kinds of wines with my homemade southern-style pecan pie, though anything with sugar and nuts is going to be slam dunk with this. It doesn't happen all that often, but it does occasionally happen that some very nice people affiliated with a winery or a distributor will send me some free wine. The US representative for the Domaine du Tariquet in France recently reached out to me and offered to send me three wines from their portfolio. I let them know that of the three, really only one would fit with my Fringe Wine theme, but they sent me all three anyway. 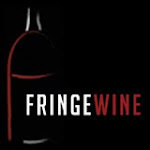 I figured since they were nice enough to send them all to me, I could bend my rules just a bit and start a new feature called Free Wine Friday where I'll profile whatever wines I've received for sample purposes, even if the wines don't fit all that neatly into my Fringe Wine paradigm. I don't expect that this will turn into a regular feature, but we'll see what happens. I do want to be sure to say that the only compensation that I have been given was a sample of the wines themselves and that my opinions expressed below are my honest impressions of the wines I tasted. This post has not been written or reviewed by anyone other than myself and I have no affiliation or commercial interest in Domaine du Tariquet or any of their business associates. 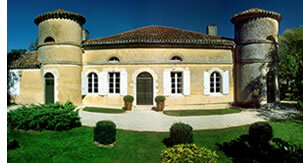 Domaine du Tariquet is located in the Gascony region of southwest France. The Gascony region is more or less the area between the Atlantic Ocean to the west and the Garonne River to the east, stretching south from Bordeaux to the Spanish border. The Domaine itself is located in the foothills of the Pyrenees mountains in a town called Éauze, which looks like the middle of nowhere on Google maps. Éauze is situated within the Armagnac region, which is, of course, best known for the production of the brandy which carries the region's name. This area does not fall into any established AOC region, so table wines made here carry the Côtes de Gascogne vin de pays designation instead. The Côtes de Gascogne is responsible for producing more than 100 million bottles of wine per year and nearly all of it is for the export market. About 90% of that production is white wine, which is somewhat unusual if you look at all the red wines produced in the neighboring regions, but which makes more sense when you remember that the grapes used as the base for Armagnac production are all white grapes. As the demand for table wines has increased, many of the growers in the Armagnac region have opted to make table wines from their grapes rather than brandy, so since they have acres and acres of white grapes at hand, it certainly makes sense that they would ultimately make white wines. Domaine du Tariquet follows that pattern as well, but before we get there, it's worth taking a look at the history of the estate and the family that has owned it for the past 100 years. Like so many great stories, this one starts out with a bear tamer and a dream. 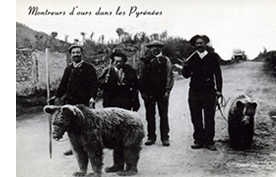 Artaud (whose first name I can't seem to find) was a bear tamer from the village of Ercé in the foothills of the Pyrenees where apparently bear taming was just something that you do. He had two (!) tamed bears that he took with him around the world in what I'm guessing was some sort of traveling act before he ultimately ended up in the US where he stayed for several years. Eventually homesickness got the better of him and he returned to France in 1912. He came across the Tariquet estate and fell in love with it, so with the financial assistance of his son Jean-Pierre, a bartender in New York, and Jean-Pierre's wife Pauline, he bought the estate whose lands had been thoroughly gutted by the Phylloxera epidemic which had left only seven hectares of land under vine and those vines in terrible shape. Artaud lived on the Tariquet estate while Jean-Pierre and his family remained in New York. When World War I broke out in 1914, Jean-Pierre returned to France and enlisted in the army. He was injured by a bayonet wound during the war and the massive blood loss he suffered caused him to suffer from amnesia. He was hospitalized in France until 1922 when he was sent back to New York to his wife who had waited for him for over eight years. Jean-Pierre was much changed from his experiences, but Pauline stuck it out with him. The two of them soon returned to France and had a child they named Hélène. Fast forward to the 1930's when a man named Pierre Grassa was working as a hairdresser in the town of Bordeaux after his tour of duty in the Joinville Battalion of the French army was finished. When WWII broke out in 1939, Pierre rejoined his old battalion, which was soon captured, making Pierre a German prisoner of war. Apparently Pierre wasn't much of a fan of being held prisoner so he escaped and fled to southwestern France where he joined the local resistance movement in the town of Éauze, which, it just so happens, is where Domaine du Tariquet is located. Pierre meets Hélène, they fall in love, and are soon married. They are still married to this day and their children, Maïté and Yves, are carrying on the family business, which has grown from the meager 7 hectares under vine in 1912 to more than 900 today, which makes them the largest family owned estate in France. In 1972, the family decided to start their own company to produce brandy rather than just selling the grapes off to other brandy houses. In 1982, they decided to make table wines as well. Yves, who took over winemaking responsibilities 25 years ago, was the first grower in the region to plant Chardonnay, Sauvignon Blanc and Chenin Blanc grapes alongside the Armagnac stand-byes of Ugni Blanc (the Trebbiano Toscana of Italy) and Colombard. It seems hard to believe that planting these grapes was ever a controversial thing to do, but at that time, it definitely was. Yves was rewarded for his risk in 1987 when one of his wines was selected as Wine of the Year in England. Today the third generation of the Grassa family, Remy and Armin, are in charge of the estate which is celebrating its 100th year under family ownership this year. Domaine du Tariquet currently makes 10 different wines, 9 white and 1 rosé, and they sent me three of their offerings to try. The first was their 2010 "Classic" bottling which is 70% Ugni Blanc and 30% Colombard. It looks like the blend for this wine may vary by vintage, as they winery currently has the 2011 info available on their website with a much different composition. MSRP on the 2010 is $8.99. In the glass the wine is fairly pale silvery lemon color with some greenish tints to it. The nose was somewhat reserved with lemony citrus and peachy fruits with a touch of herbaceousness and a bit of leesy funk (which blows off pretty quickly after opening). On the palate the wine was on the lighter side of medium with fairly high acidity. There were zippy lemon, lime and grapefruit citrus fruits along with some ripe peach. The overall character was a bit tart, but the wine more than made it up for it with an incredible intensity that was very surprising. This wine overdelivers for the price in a big way and is a really great value. I have a lot of trouble finding wines I enjoy drinking in the under $10 range, but I would drink this absolutely any time. The second wine I tried was the 2010 Chenin/Chardonnay which is 75% Chenin Blanc and 25% Chardonnay. MSRP for this bottle is $10.99. In the glass the wine was a very pale silvery lemon color. The nose was moderately aromatic with a lot of ripe pear fruit an a touch of lemony citrus and white flowers. On the palate the wine was medium bodied with fairly high acidity. It tasted just off-dry to me, but Tariquet doesn't put any residual sugar information on their website for their wines. All of them are pretty low alcohol (around 11% each), so it wouldn't surprise me if there was a bit of sugar kicking around here. There were flavors of lemony citrus and green apple with a touch of lime, tart pineapple and ripe peaches. It was lean, sharp and zippy, so if there was any residual sugar in it, it was being balanced nicely by the racy acidity. I enjoyed this wine, but not nearly as much as the Classic. At $11 a bottle, it does represent a very good value, though, especially for fans of South African Chenin Blanc or fans of unoaked Chardonnay. The email they sent me advises drinkers to "enjoy with pad thai, samosas, asian dumplings, and roast pork," which sounds about right to me. The last wine that I tried was the 2010 Côté, which is a blend of 50% Chardonnay and 50% Sauvignon Blanc. MSRP for this wine is $14.99. In the glass the wine was medium lemon gold color. The nose was very reserved with some grapefruit and green apple aromas, but it was mostly a total blank. It does open up a little bit with some air, but not much. On the palate the wine was medium bodied with fairly high acidity and, again, I thought it was probably just off-dry. There were flavors of pink grapefruit, ripe apple and peaches with a touch of honey and that Sauvignon trademark grassy herbaceousness. The wine had much more Sauvignon Blanc character than Chardonnay, which probably shouldn't be all that surprising. It had the nice balance between the lean, sharp acidity and the round, ripe, honeyed peach flavors that the Classic wine had, but again, I preferred the Classic bottling to this one. The email from the Tariquet representative suggests pairing this with "fish & chips, quail, or roast chicken." Overall, I found these wines fairly enjoyable. They're all fairly affordable and represent good values for their respective prices. They seem like they would be versatile food wines with enough acid to stand up to a variety of foods and just enough residual sugar to be good for spicier Asian or Indian inspired dishes. The estate offers a late harvest Gros Manseng and another late harvest Petit Manseng that I'd be very excited to try if I ever come across them. There's a tension in wine, as there is in many fields, between science and art. There are those who believe that science and technology are the way forward and that the best thing we can do to make better wine is to do more research and build more machines. On the other end of the spectrum, you have the minimalists and the artisans who believe that the best wine is made with little intervention and in the most natural way possible. Science is an interesting tool that is best used sparingly, if at all, and technological advances in viticulture and oenology are best avoided as they interfere with the natural process that makes wine more than just an alcoholic beverage. Opinions on the role of research and technology in the field of wine is more contentious than for any other agricultural product on earth. While the organic and natural food movements are definitely gaining steam these days, most of us still don't really care whether our corn is genetically engineered or whether our wheat was picked by hand or by machine. When it comes to grapes, though, it's a whole different ballgame. As with most issues, I find myself somewhere in the middle of this argument. I am fascinated by the body of scientific research done on grapes, as many of my recent posts will indicate. I also can't help but feel that modern technology has a deserved place in most wineries and has served to elevate the average quality of wine on a worldwide scale to an extent that is difficult to measure. On the other hand, I am wary of things like reverse osmosis machines and Mega Purple. I have a soft spot for the backwards, ultra-naturalist wines of producers like Frank Cornelissan and Vinos Ambiz, but I wouldn't want to drink them all the time. I believe in terroir, but am not a fanatic or a mysterian about it and am skeptical about the kinds of things that a place can actually contribute to the overall flavor of a wine. I guess what I'm trying to say is that I have faith that science and technology can deepen our understanding of wine and even improve the overall quality of it, but only if applied in a careful, judicious kind of way that is respectful of the unique qualities of wine that make it different from any other agricultural or consumer product. All of which brings us to Dr. Harold Olmo and today's grape, Emerald Riesling. We've briefly dealt with Dr. Olmo in the past when we took at look at one of his creations, the Symphony grape. Dr. Olmo was a scientist at the University of California, Davis, which is the institution in the US most synonymous with grape and wine research. As a result, UC Davis is something of a polarizing force in the world of wine and has been at the forefront of the struggle between the idea of wine as an agricultural consumer product and the idea of wine as an artisanal creation that is crafted, not manufactured. UC Davis was somewhat notorious at one time for churning out winemakers whose wineries resembled laboratories more than farm buildings and who were more concerned with making a technically pristine wine than an interesting, characterful one. Dr. Olmo worked at UC Davis for many decades. In the 1950's, his creation of a quarantine facility for foreign vines on the UC Davis campus allowed California wineries to import vines safely and legally into the state and resulted in an expansion of the number of varieties available for use within the state. What he is best known for, though, are the so-called Olmo grapes. He is credited with creating over 30 new grape varieties in his time at UC Davis, which have had a huge impact on the wine industry in the state of California, though most consumers aren't aware that the grapes exist. Since UC Davis is a state agricultural school, the focus of the grape breeding program there (as it is in similar institutions in Germany or at Cornell in New York) was to create new grapes that could be profitably grown (meaning the vines should yield prolifically) in some of the harsher climactic regions of California. In particular, Olmo was interested in grapes that could withstand the intense heat of the Central Valley, which is much too hot for most European grape varieties. His aim was mostly to create high yielding vines that could tolerate these conditions and would make "good" wine, and it is this focus on production over superior quality that causes many wine lovers to look on Olmo's work with suspicion (or outright disdain). While his work wasn't revolutionary in terms of quality wine production, it was profoundly important economically and there's something to be said for that. The two most successful grapes he created to this end were Ruby Cabernet and Rubired, which are widely grown in some of the hotter valley regions of California, but which are mostly used in bulk wine production. The most successful white grape that Olmo bred was Emerald Riesling, which was created by crossing Riesling and Muscadelle (maybe...see note at the bottom). Emerald Riesling and Ruby Cabernet were Olmo's first wine grapes (he had released a few table grapes prior to this) and they were released together in 1948 after nearly a decade of testing and experimentation. Like the grapes mentioned above, Emerald Riesling was bred specifically to yield profusely and to endure the intense heat of some of California's hot, fertile valley floors. Unlike Rubired and Ruby Cabernet, Emerald Riesling has enjoyed some success as a varietal wine. In the 1960's and 70's, Paul Masson marketed a wine called "Emerald Dry" which was made from Emerald Riesling grapes, which was quite successful for awhile. The wine is apparently still made (with a retail price around $5 a bottle), though it is nowhere near as popular these days. It is estimated that fewer than 250 acres (100 hectares) of Emerald Riesling are left in the United States. Though the grape is declining in popularity in its native home, it is has found new life in an unlikely place: Israel. Israel is interesting because it lacks any native wine grape varieties, so all grapes grown for wine production in Israel have been imported into the country at some point. In the 1880's, Baron Edmond de Rothschild decided that Israel would be a good place to grow grapes for wine. In 1887, Rothschild began to bring in the major red Bordeaux varieties and began to focus seriously on producing fine wine in Israel. Phylloxera put an early stop to Rothschild's dreams, though, and in its aftermath, the locals planted the high yielding, low quality grapes of southern France like Carignan and Alicante Bouschet. The wine industry began to turn to the "international grape" varieties in the 1970's and quality wine production really began in earnest in the 1980's. Emerald Riesling was brought over at some point in the 1970's and by the mid 80's, it was the best selling white wine in Israel. Like Lancers or Mateus from Portugal or Liebfraumilch from Germany, these wines were made in a semi-sweet style and were not all that expensive. The wines are still fairly popular, but they don't seem to be the face of the Israeli wine industry any longer. I'm finding more and more Israeli wines made from the international varieties on my local shelves these days, but have only ever found a single bottle of Emerald Riesling. The wine that I was able to find was the 2010 Tishbi Emerald Riesling from Shomron, Israel, which I bought for the whopping price of $18 at a convenience store in Harvard Square. In the glass, the wine was a pale lemon color with a lot of green in it. The nose was nicely aromatic with juicy, exuberant pineapple, green apple and lime fruits. On the palate the wine was medium bodied with medium acidity. It was off-dry to medium sweet with flavors of sweet pineapple, honeyed apple and lemon curd with a touch of honeysuckle flower. The finish on the wine was jarringly short and ended on an abrupt, bitter note. One of the hallmarks of Emerald Riesling is its ability to maintain its high acid level in very hot growing areas, but I found this example kind of flabby. It does really need some acid to prop up the sugar in the wine, but it ultimately falls flat and just isn't that interesting to drink. Fans of Liebfraumilch will find a lot to like here, but $18 a bottle is too much to ask for wine at that kind of quality level. I'd avoid this unless you're interested in it for novelty's sake or are a big fan of alcoholic Kool-Aid. **Every source online says that Emerald Riesling is a cross between Riesling and Muscadelle, but the Oxford Companion to Wine has it listed as a cross between Muscadelle and Grenache. When I emailed them to inquire about the discrepancy, Julia Harding would only respond that the Riesling x Muscadelle info was incorrect, but that I'd have to wait for the publication of their new book on grapes for the full story. I was able to track down Dr. Olmo's paper written in 1948 when he released the grapes where he says the grape is a hybrid between White Riesling and Muscadelle of California. The VIVC has the parentage listed as Riesling x Muscadelle of California, and Muscadelle of California is listed separately from Muscadelle. My guess is that Muscadelle of California is a different grape than the Muscadelle propagated in France and Australia, but since the OCW is being coy about it, I suppose we'll have to wait until October to know for sure. Reader George sent me a link to a UC Davis newsletter published in 2006 that clarifies this issue (here). The correct parentage for Emerald Riesling does appear to be Muscadelle x Grenache. I've written a longer piece here detailing this information and also detailing many of the problems that I have with the way that the OCW has handled this issue. If the category "Portuguese wine grapes" ever came up on the Family Feud, I'd be willing to bet almost anything that Touriga Nacional would be the number one answer by a fairly substantial margin. Touriga Nacional is known as the Queen of Grapes within Portugal and is that country's answer to Tempranillo or Sangiovese. It is THE main quality grape used in the production of Port and, in more recent years, has taken on a larger role in the production of dry table wines in the Douro and Dão regions of Portugal. While it may not be a household name right now, it is a grape that is fairly well known to experienced wine drinkers and which can be had quite easily from virtually any shop. So why write about it here? Because this particular bottle came from grapes grown in Pennsylvania. Before we get to that, let's talk a little about the grape itself. 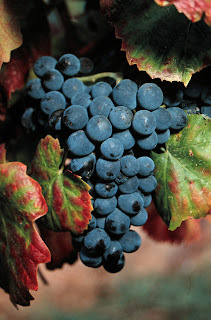 Despite Touriga's reputation as the highest quality wine grape in Portugal and despite the fact that Touriga Nacional and Portuguese wines are practically synonymous at this point, it wasn't that long ago that the grape was on the brink of extinction. The vine is prone to poor fruit set and, when the fruit actually does set, it sets into a small number of small clusters with small berries. This means that the wines made from these grapes are uniquely deep in color and intensely flavorful and aromatic, but it also means that the vines produce pitifully small yields, which is not a quality that growers are enamored of in the vines that they cultivate. Despite that, by around 1900, Touriga Nacional was thought to cover over 90% of the vineyard land in the Dão. As we've seen so many times, though, once Phylloxera came to town, everything changed. After the scourge had decimated their vineyards, many growers decided to plant higher yielding vines that they could get more juice (and therefore more wine) from. The vine was perilously close to disappearing in the mid 20th Century but it hung on. Today it only accounts for about 2% of the vines of the Douro Valley and possibly up to 20% of the vines of the Dão. Given its rising popularity on the international scene, its plantings are increasing and the vine is finding its way south through Portugal, but not all that quickly. It is currently planted on about 3500 hectares (about 9000 acres) throughout Portugal. The name Touriga may come from a village in the Dão called Tourigo, where the grape is thought to have originated. The Nacional part means exactly what you'd think, and I'd be interested to find out how it got tacked on at the end. There are a host of other Touriga grapes such as Touriga Franca, Touriga Branca and Touriga Fêmea which, as far as I can tell, aren't related to one another, but the two most widely planted are Nacional and Franca. Touriga Franca used to be known as Touriga Francesa, which means French Touriga basically, though the grape doesn't appear to be from France. My guess is that both grapes were thought to be from around Tourigo, but, for some reason, Touriga Franca was thought to have come from France before then, while Touriga Nacional was thought to be indigenous to the area. The Nacional was tacked on to indicate that it was a native Portuguese grape as opposed to a grape imported from another country that happened to land near Tourigo. As for the other two Tourigas, Branco means white, so you can guess how that it got its name, while a synonym for Touriga Fêmea (while means "female Touriga") is Touriga Brasileira, which may indicate that the locals thought there may be some kind of connection with Brazil (which was a Portuguese colony for many years). All of that is conjecture, though, and I'd be interested to hear from anyone who may know more. Touriga Nacional is grown outside of Portugal, but like most Portuguese wine grapes, it hasn't made a big splash anywhere outside of its home country. There is some grown in Spain, Australia and a very little bit is grown in the United States. The grape really seems to thrive in the intense heat and poor, rocky soils of the Douro valley, so when my sister gave me a bottle of Touriga Nacional from a winery in Pennsylvania for Christmas, I was pretty surprised. The winery is Paradocx Vineyards and they're located in Landenberg, PA, which is in the southeastern corner of Pennsylvania, very near Wilmington, Delaware. My only prior exposure to this winery was when my wife went to a wine festival in Pennsylvania with her siblings a few years ago and came home with a paint can full of 3.5 liters of wine. I've written on other sites about my frustration with wineries trying to grow grapes that are climactically poorly suited to their region, and while I don't necessarily want to run through that argument again, it certainly looked like this might be a prime example of that phenomenon. It turns out that Landenberg isn't that much different from the Douro Valley in terms of latitude, but I don't know enough about the climates of the two regions to be able to say how similar or dissimilar they are (my gut tells me Portugal is hotter and drier, but I wouldn't swear to it). I'm certain that the hills of Southern Chester County Pennsylvania aren't as steep and rocky as the vineyards of the Douro, though, so I was curious to see what the wine would be like. As I mentioned, my sister in law gave me a bottle of the 2010 Paradocx Vineyards Touriga Nacional, which it looks like retails for about $29 on the winery's website. In the glass the wine was a pale ruby color that looked more like Pinot Noir than Touriga Nacional. As mentioned above, the berries of Touriga Nacional are very small which usually produces a very deeply colored wine, but I could easily see through this wine, which wasn't necessarily a promising start. The nose was nicely aromatic with spicy, dusky red cherry and raspberry fruit with a bit of wild strawberry, tea leaves and damp earth. On the palate the wine was medium bodied with medium acidity and low tannins. There were flavors of spicy cherry and raspberry fruit with strong black tea and damp earth notes. The more I smelled and drank this, the more concerned I was that maybe I just had Pinot Noir on the brain, but my wife confirmed most of my taste sensations. This is kind of a hard wine to talk about. It wasn't a bad wine as far as wines go. If I had been served this without any idea of what it was, I would have found it quite enjoyable and probably would have guessed that it was a cool climate Pinot Noir based wine. With no information other than the juice in the glass, I would say it was a decent wine but not necessarily something I'd rush out to buy again. But if you consider it as an example of a wine made from Touriga Nacional grapes, it feels like the conclusion that you come to about its quality has to be radically different. As an example of a Touriga Nacional wine, it's a very bad wine as it lacks virtually all of the characteristics that you would expect to see in a wine made from that grape. It is light and delicate where Touriga is brawny and intense. It is marked by low color, low tannins and red berryish fruit where Touriga is deeply colored, fiercely tannic and loaded with black fruits. So is the wine good or bad? What can we really say about this wine? When we had no information, we found it enjoyable, but learning additional information about the wine has prejudiced us and caused us to think about it in a different, more negative light. Is our first sensation of enjoyment the most important one or should our critical estimation arrived at after considering all of the important facts of the matter be privileged? Has the additional knowledge poisoned the well, so to speak, or has it given us a deeper perspective and allowed us to see something closer to the truth?